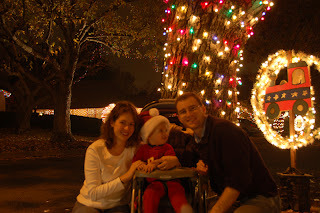 We've been scouting out the light displays around where we live, driving around each night as we can, searching for a good neighborhood to walk around as a family and enjoy the holiday festivities. We found the jackpot in "Upper Hastings Ranch" last night. 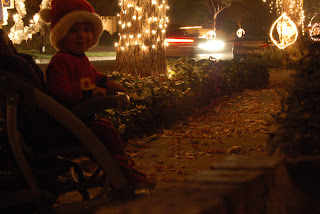 And with Starbucks hot chocolate and Dylan in tow, we were off to a fun evening walking up and down the streets decked out with spectacular displays. Awesome! Each street throughout the neighborhood had a common-themed marker in front of each house along the street. 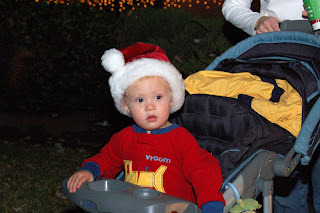 There were snowmen, spinning globes, strings of lighted lanterns, Christmas trees, etc. Some of the houses rivaled Clark Griswold's from Christmas Vacation. 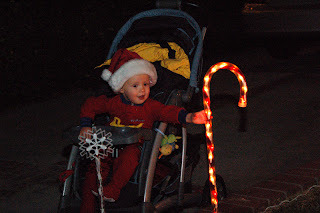 Here's our sweetie enjoying the lights and yard decorations. What beautiful winter weather - I'm sure you don't miss the cold-wet-snow and ice we get here in the Midwest, even though autumn is gorgeous, (as you so beautifully captured this year).